I started FiveGallonIdeas.com because I found myself solving more and more of my problems with five gallon buckets. 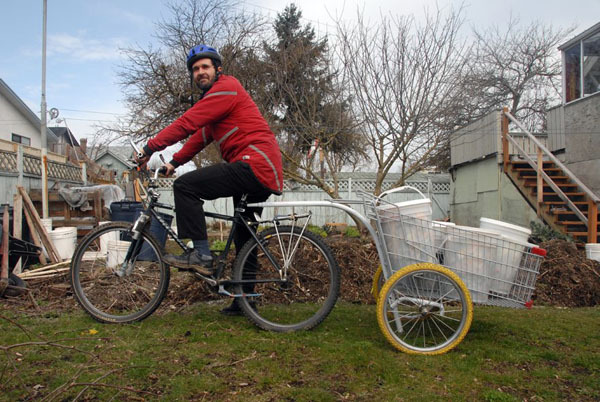 I manage a bicycle-powered compost company called Pedal to Petal which owns over 1000 of these buckets, so I am constantly buying, cleaning, using, and wearing out these buckets. One of my favorite philosophers Ran Prieur, says that five gallon buckets are the best use for fossil fuels. Prior to the plastics revolution, we didn’t have any storage container with the sanitary, strength and airtight qualities of a plastic bucket.